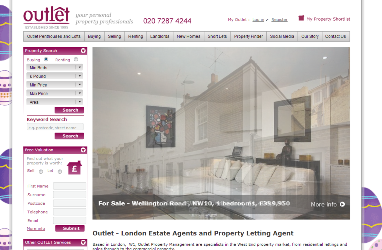 Outlet Property is an estate agent and property company based in Soho in Central London. They operate across all areas within zones 1-3 of London, providing services for buyers, sellers, landlords and tenants. Outlet is a small business competing with large London and UK-wide chains. Not easy in a highly competitive market, and when you’re up against companies with high marketing budgets. Their service and pricing are every bit as good as larger agencies; the challenge is for people to find them. For this, it’s essential that they are near the top of Google for relevant and popular search terms. Just as important, the copy must be interesting and persuasive enough for would-be customers to read and then to get in touch. Outlet had used an SEO company for some time, but were not pleased with the results. The company tended to use outmoded or counter-productive methods, such as link farms and submssion to masses of irrelevant search engines. And they liked to use random phrases in bold or underlined; this looks odd to readers, and these days is just as off-putting to search engines. The SEO company had also put little thought or insightful research into the choice of keyword terms, preferring to try and dazzle with reams of computer-genrated reports but almost no human insight. On the copywriting side, the copy was written by the MD or other team members at Outlet and the quality was hit-and-miss, while also not taking search needs into account. At the same time, it meant that less time could be spent concentrating on their core business. I was asked to help in late 2011. I started by doing proper keyword research, along with market research, taking the time to get to know my client’s business. The site was and is absolutely massive; while I have written or rewritten scores of pages, including all the most important ones, there’s still about half the site I haven’t looked at. However, by concentrating on key pages, I was able to show the difference made by proper research, followed by good copywriting. Gradually it became obvious that those pages I had looked at were starting to out-perform others with poor quality content, and with random bolds and capitals. Despite working for a year with the SEO company, and spending a lot of money with them, the difference they had made to traffic had been negligible. So about six months, after I started working for Outlet, the client took the decision to part ways with the SEO firm and concentrate budgets with me. I’ve also continued to advise on SEO generally – simple, free or very low cost steps which Outlet can do themselves to help rankings. At the same time I provide regular, clear and actionable reports, which I research and write myself, rather than simply forwarding meaningless computer-generated figures. In the first year I worked with them, overall traffic has more than doubled, and enquiries are up substantially too. By concentrating on certain sections for copywriting, Outlet is also becoming known, not just for general property services, but for specialist areas such as penthouses and lofts. Their website is ranking very well for some important and popular search terms. Most recently, I have also been writing blog posts for them as well on key areas of their business, which are paying big dividends. Follow the link to see more property copywriting examples.